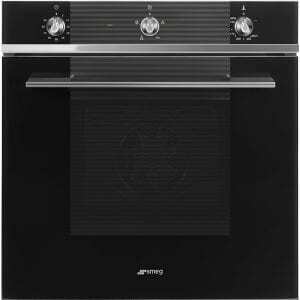 This Smeg built in microwave and grill offers superb versatility. Finished in stunning silver glass and with a range of matching ovens available it's the perfect addition to your new kitchen. 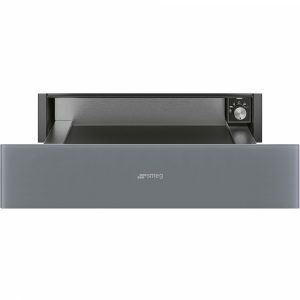 With 21 litres of space, this handy warming drawer is great for warming food or crockery. Finished in silver with a handleless front, it looks stylish and modern, matching perfectly with other items from Smeg's range. 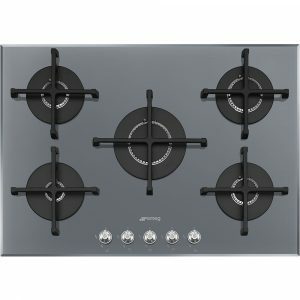 This superb 72cm wide gas hob from Smeg boasts five gas burners with cast iron pan supports. Finished in silver glass with bevelled edges it will look great in any kitchen. 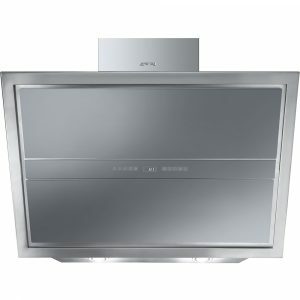 Whether you want to install it with ducting or charcoal filters, this 90cm wide Linea chimney hood from Smeg offers great performance, with extraction rates up to 600 m³/hour. There are 3 speed settings, plus an intensive mode to choose from, and with built in lighting, it's easy to keep an eye on what you are cooking. 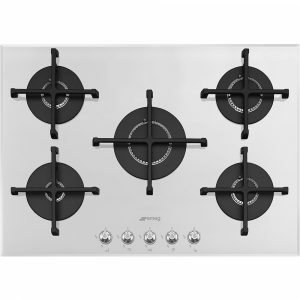 Finished in silver with stainless steel, the angled design makes a stunning feature in your kitchen. 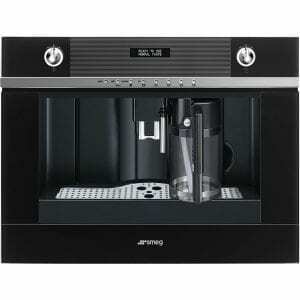 With the Smeg Linea coffee machine, you will be able to make delicious coffees to impress your guests! Able to use coffee beans or ground coffee, this 1.8 litre coffee machine finished in black would be a stylish feature in a modern kitchen. You can also make a cup of tea or a hot chocolate using the hot water function so it is ideal for non-coffee lovers too! Adjust the cup size and coffee strength to your exact requirements with ease using the Multilanguage LCD display. Love a cappuccino? There’s even a frothing nozzle and steam function designed to help you make the perfect cappuccino! 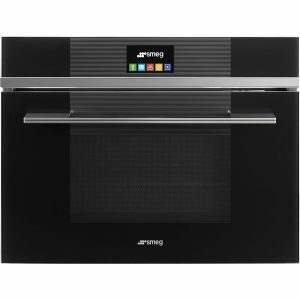 If you enjoy cooking using gas, this great Linea oven from Smeg offers brilliant performance and versatility thanks to the electric grill. There’s plenty of room with a 60 litre capacity and it’s even adaptable for LPG. There are 8 cooking functions including Rotisserie, for fantastic, juicy meats. 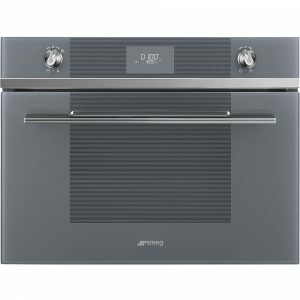 Accessories which come with this Linea oven include; an extra deep roasting pan, a grill pan and a chrome shelf. Thanks to the enamel interior, cleaning this oven is quick and easy. 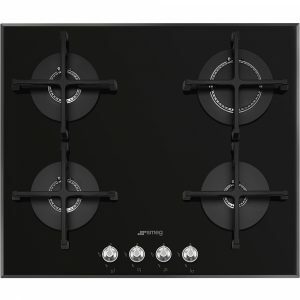 Finished in black, it will make a stylish addition to a kitchen. 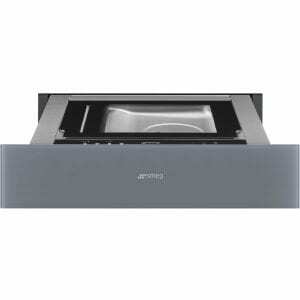 This modern Linea Sous Vide vacuum sealer drawer from Smeg is 15cm high and is finished in silver glass. Push-pull handleless opening means there’s no need for unsightly or bulky handles and the touch controls also continue this sleek and attractive design. Included with this appliance are 50 bags for food conservation and 50 bags for sous-vide cooking. There are three levels of sealing and three levels of vacuum in containers, giving you plenty of options to create the perfect settings for your food. 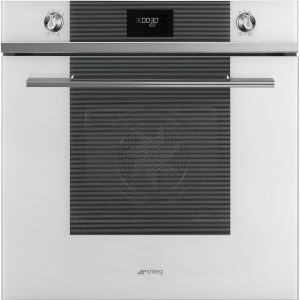 Superb self cleaning technology and bags of style is what this built in electric single oven from Smeg has to offer. Boasting a large 70 litre capacity and a range of accessories, you'll have everything you need and more for everyday cooking. Forget scrubbing the oven, the pyrolytic technology will keep it in tip top condition. It safely heats up to extreme temperatures burning off any dirt to a fine ash, all you need to do is wipe it away with a damp cloth. 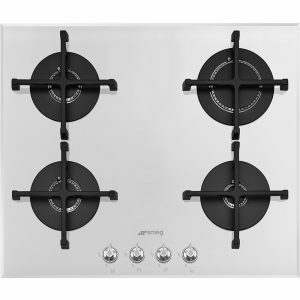 Finished in white, this model would look great in a modern kitchen. It can be installed under your worktop or in a tall housing unit.